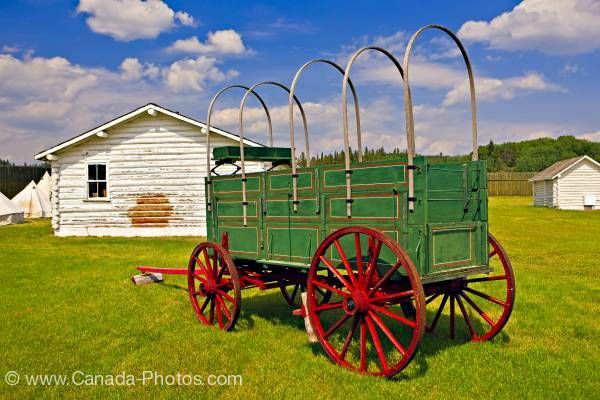 Photo of a wagon sits outside the log cabin stables at Fort Walsh National Historic Site, Cypress Hills Interprovincial Park, Saskatchewan, Canada. A wagon painted green with red and white trim with the stables in the background sits on the grounds of the Fort Walsh National Historic Site. The large spoke wheels of the wagon are painted red stand out among the green of the wagon and the fresh green grass of the lawn. Wagon outside the stables at Fort Walsh National Historic Site, Cypress Hills Interprovincial Park, Saskatchewan, Canada.